Twenty of Kangaroo Island’s finest artists are at the centre of our annual South Australian Living Artists Festival (SALA) exhibition at Adelaide’s National Wine Centre again from August 3 – 26, 2018. 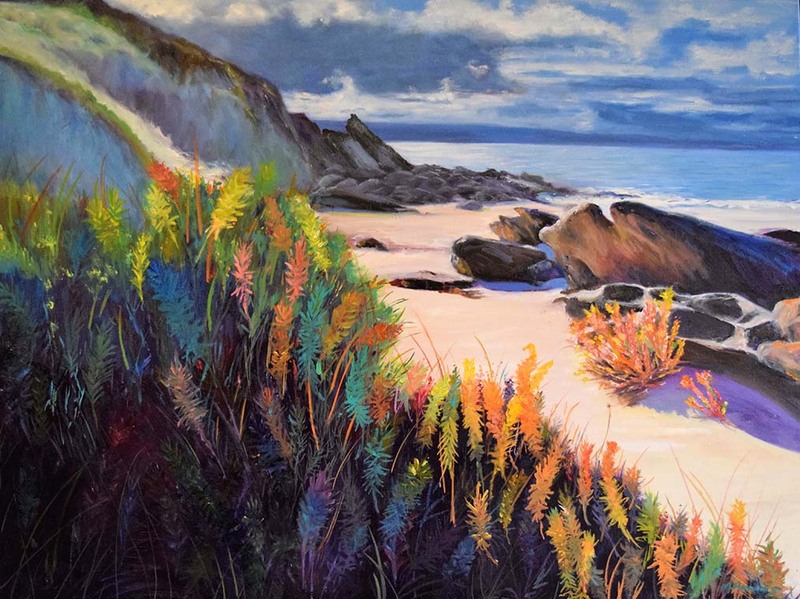 The job of curating this thought-provoking and at times starkly challenging array of themed art inspired by the constantly changing cliff tops and coastal dunes of Kangaroo Island has led curator Fleur Peters on yet another inspirational journey of island discovery. Fleur has certainly done this before – this being the 9th consecutive How Do We Love Thee?… exhibition she and her team have brought to the Adelaide SALA audience. It is obvious when viewing the work featured in this highly-anticipated annual exhibition, that this year’s theme has evoked strong, and deeply personal inspiration. With much of the local community sharply focused on the future and protection of a coastline at once fragile and indomitable during the past twelved months, Adelaide audiences now have an opportunity to view the island and her coastline through island eyes. As in past years, our 2018 SALA Festival exhibition of Kangaroo Island artists offers a breathtaking view of the Island and we can’t wait to share it with the world. South Australia’s Living Artists Festival, more commonly referred to as the SALA Festival has become a South Australian Arts institution, this year celebrating its twenty first year. One man who has shared in a huge part of that history (from a range of different perspectives) is former Arts Minister and outgoing Festival Chair John Hill, who will open How Do We Love Thee? Let Us Count The Ways…KI Cliff Tops and Coastal Dunes in the Vines function room, National Wine Centre, on Sunday 5 August at 2pm. SALA values the partnership with KI – your contribution is unique and gives mainlanders an annual opportunity to survey what is happening on the Island. 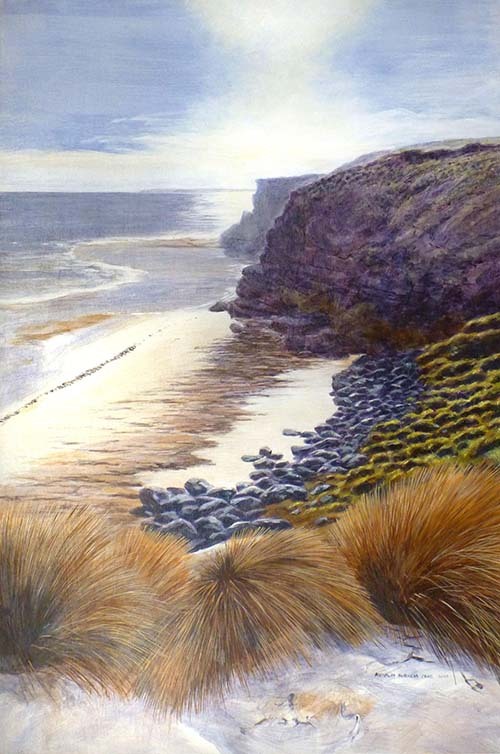 The pristine coastline (cliffs and dunes) of Kangaroo Island is a wonderful theme. There is so much of Kangaroo Island to see and experience at Adelaide’s National Wine Centre this month we think you’ll want to come back for more! When Kangaroo Island comes to the National Wine Centre each year during August it’s a wholly immersive experience. Executive Chef Steven Clark and his culinary team will feature local produce on charcuterie plates and menu specials. And we are delighted that False Cape Wines – winners at June’s KI Food Wine Awards – will sponsor the preview, showcasing wine at the opening and will also be featured in the renowned Wined Bar. Visit again for an insightful Artist led Walk and Talk with artists Nick Hannaford and Cecilia Gunnarsson on Friday August 24th at 12:30pm. Numbers will be limited, so register for a place by calling exhibition curator Fleur Peters on 0417 832 037 or use our contact form. With all of this and more than 120 incredible Kangaroo Island inspired artworks on show, we think you’ll be drawn back to this year’s exhibition time and time again. For updates on How Do We Love Thee?…Let Us Count The Ways – Kangaroo Island Cliff Tops and Coastal Dunes, Send your name and email address via our contact form and we’ll make sure you receive occasional updates by email during and after the exhibition.